company with a reputation for customer service excellence. Sealing leaking corners and joints with a high-quality sealant — this fix your leaky eavestroughs and gutters once and for all. Downspout guard installation — direct the flow of water and prevent unnecessary clogging using this simple and effective system. You need to do this only once. Flush out your eavestrough — we find out where exactly your pesky gutter leaks are enabling us to fix them once and for all. Very good to do before the rainy season starts, which can turn tiny holes into large inconveniences! Professional GTA eavestrough and gutter cleaning service. At NICK’S Window Cleaning, we deliver an exceptional job on every project; eavestroughs, gutters, fascias, and soffits are all cleaned by hand and with the use of professional tools to remove solid matter such as leaf residue and moss build up. We can also provide post-construction gutter clean up which in some cases requires the use of a special iquid which will dissolve even the toughest stains and residues, leaving your gutters clean and shiny ready to do their job. Cleaning your eavestrough & gutter system is incredibly important. During heavy rainfall, overflowing water can cause basement flooding leading to expensive, stressful water damage and destroyed personal property. 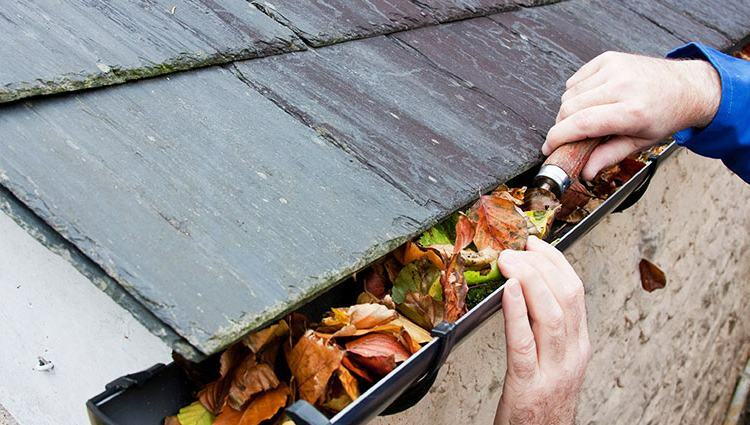 One significant problem with clogged gutters is standing water, not only a potential home for pests but the added weight puts a strain on the eavestroughing. In the winter, any standing water in your eavestrough or downspout can freeze, since water expands when it freezes this causes warping and damage. This is a recipe for disaster as in some cases, eavestroughing and gutters can fall right off homes, potentially causing bodily harm and/or property damage. Toronto, Mississauga, Etobicoke, Vaughan, Scarborough, Richmond Hill, Maple, Concord, Woodbridge, Thornhill, Brampton, Markham, and the rest of the Greater Toronto Area – call us for details.